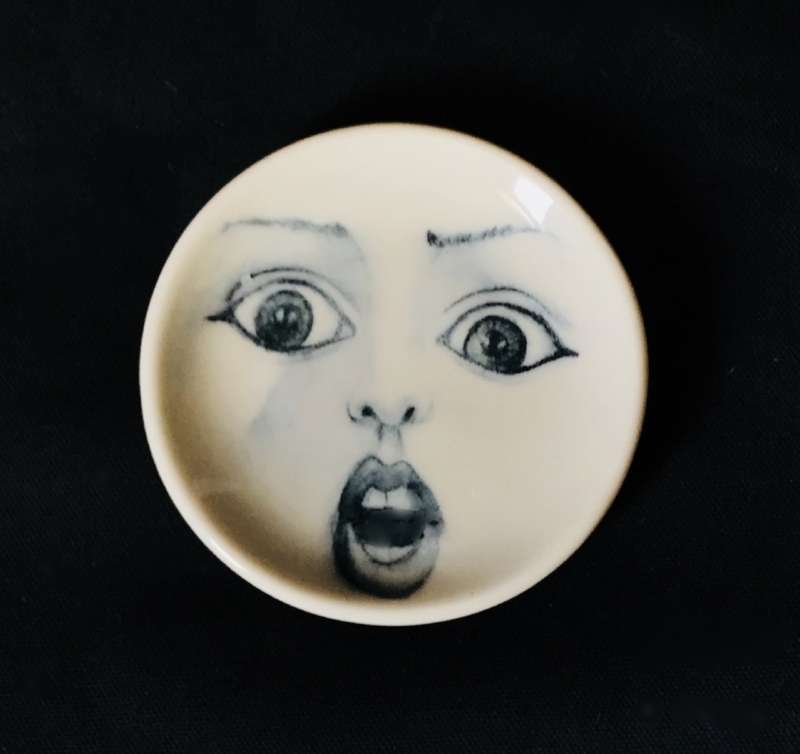 I use an underglaze pencil to draw most times. The pottery I make is my canvas. Teaching myself to draw on pottery was a new, wonderful experience. Each one a little better than the last. Firing it to cone 5 (which is over 2100 degrees F) made it a challenge to get the right shading or any shading for that matter. I would glaze the piece with a glossy clear glaze and it would fire out a lot of the pencil. I learned to go dark. here it is finished. I added an underglaze red to the lips. That’s tricky, too! Red burns out. So applied about two to three coats. Too much ruins the look as well as not enough underglaze, too. Here is is a picture where I took a before and after the firing without glazing over the face but taking it to the 2100 degree temp. The one on the left is finished. Not much of a difference. I believe that when I glaze over the piece the underglaze pencil melds with the glaze. So. I had to learn a couple things. Go dark and shade darker than normal. Rinse the piece before drawing on it. The shading is better when you do. Let the piece dry completely before glazing. That way the underglaze pencil doesn’t meld with the glaze as much. Sometimes I use a solution of gum and water and spray it on the drawing. Let it dry then glaze. The tools are simple. I take a small flat angled brush and trim it short and use it to blend my strokes when I draw. I use some regular brushes as well for the larger areas. Next post I will add a video of me drawing a piece. It’s a labor of love. 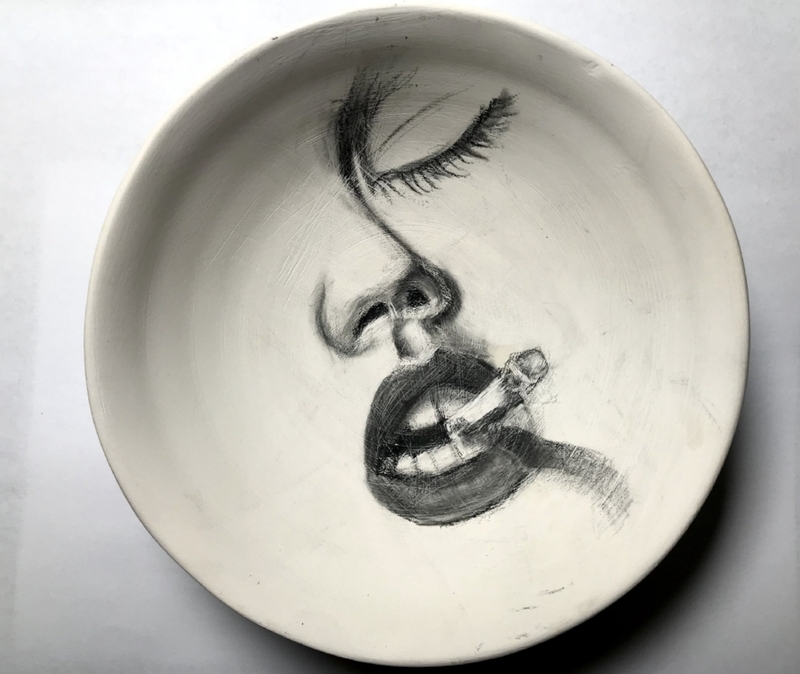 Combining my drawing with pottery has given me a new experience in art that has brought endless pleasure as I learn a new technique that is self taught. I have yet to tire of the process.